"We just received our picture album. We really don't have words. You managed to capture the absolute essence of our wedding. We both were VERY teary eyed going through the album. We will cherish these for the rest of our lives. Thank you again." ~ Mike C.
"My senior pictures came out great! I've never done a photo shoot or anything of that sort, but she made it super fun! Would definitely use her again!" ~ Melody M.
"I had Annette capture my engagement and wedding photos a year ago. She is so amazing at what she does! My husband doesn't always like taking pictures but she made it fun and was able to get him to participate in everything! I bought an extra package for my engagement photos because I loved them so much! She really captures the beauty in the pictures! She knows what backgrounds will look best. I love looking back at all of the wonderful pictures that she captured of our special day! She is very professional and easy to get along with. I would recommend her for any type of photography!" ~ Kim M.
"Annette is fabulous to work with. We've used her twice and love her work." ~ Debbie F.
"Your photos of newborn baby Nathan came out beautiful! Thank you so much! I love how patiently you worked with him." ~ Jenn W.
"Annette was so fun to work with, especially with three teenage boys. She was able to capture our fun loving, laid back personalities while in a beautiful setting. Annette went above and beyond to help me create a beautiful cluster of pictures for my living room to allow us never to forget the day! Thank you BeechTree we can't wait to work with you again! ~ Vicki E.
"She was wonderful! She is very professional. She was on time, very accommodating and made us feel comfortable. We had our engagement and wedding pictures taken by Annette. We loved her! She took amazing photos for us to cherish forever! Could not have asked for better person to photography our special day! Thank you Annette" ~ Lauren S.
"Loved working with Annette and our pictures turned out fantastic!! ~ Leann M.
"I wanted to do photos for an upcoming birthday, and I wanted a "fashion" style session. Annette took the time to plan location and styling and then we went out and had fun! I've never done a session like this so was nervous at first, but she made it easy to relax, and I'm really happy with my pictures!" ~ Angela G.
"We had Annette do our wedding photos and were nothing short of amazed at the outcome! she managed to be everywhere at once and not only captured images but also our memories of that day. We had so many options to choose from and have enjoyed sharing our photos with family and friends. We will treasure these pictures and are so thankful for the amount of time and energy Annette put into making our day special. We HIGHLY recommend her to everyone!" ~ Amber O. "Annette did an awesome job at making us look better than we thought possible. We've gotten a lot of compliments on our engagement pictures; people say they like how they can look so good without being photoshopped to death. 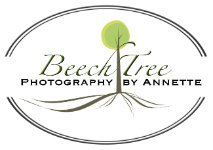 Definitely consider BeechTree for your photography! ~ Tim M.
"Annette did a fantastic job at our family session. She quickly established a great rapport with the grandkids and made us all feel comfortable being in front of a camera. I am so happy with our family pictures! ~ Melanie N.
"We choose BeechTree Photography for our wedding day and we couldn't be more pleased! Professional, fun but most of all, easy to work with. We won't hesitate to book sessions in the future" ~ Cherie O. "Annette is amazing! I can't wait for our next photo shoot!" ~ Cindy B.